Dog gum disease, tartar covered teeth, bleeding gums and foul breath problems are probably the number one health issue I’ve seen over the years observing dogs. Beyond my observation, research indicates periodontal disease to be the leading precursor to just about all other diseases that can possibly ruin your dog’s life. The funny thing is, it’s the most obvious condition when you look for it, yet the least noticed by dog owners. People simply have not thought to regularly inspect inside their dogs mouth, and in most cases they just seem to accept that their dog’s smelly breath is “just the way it is”, without considering for a moment why, let alone how, it happened. Commercial canned food and grain based kibble do not clean teeth. Sludge from the food sticks to the enamel, causing bacterial growth and tartar. Over time gingivitis pockets form under the gum line, eventually leading to periodontal disease. These conditions are easy to see at a glance, as the gum line around the teeth will be inflamed and quite red in color with yellowing teeth, in place of salmon pink gums supporting bright white teeth as they should be. The gum-tooth interface will be lined with tartar buildup, instead of a clean smooth transition between gum and tooth. Once your dogs gums are heavily encrusted and as a result sore and swollen, toxins from the bacteria will leach down under the gum line to the roots of the tooth and into the blood stream that feeds the jaw line. Once in the dog’s bloodstream, bacteria can then enter and infect organs such as the liver and kidneys, and very quickly the immune system becomes compromised, ultimately leading to disease. 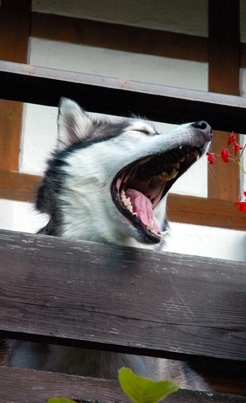 Most do gs will have bad breath at some point in their lives, due usually to consuming commercial food. 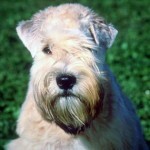 By age three, 80 percent of dogs will have dog gum disease or periodontal disease needing treatment. 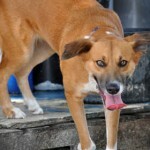 Vets are often nonchalant about bad teeth and see dental scaling and polishing as a normal procedure. Marketing hype over the cleaning properties of prescription kibble, dental chews and similar products are a nonsense, as the base of teeth at the gum line are untouched and the rotting process will continue from the accumulated sludge. Red swollen gums noticeable to the right of the brush head. The gums are bulging out over the base of the tooth. They should be flat at the tooth gum interface and light pink in color. The canine or fang tooth at the front is yellow and although you can’t see where it meets the gum, the base will be covered in tartar build up. The gap along the row of teeth where a tooth should be has gone rotten with dog gum disease and has fallen out or been extracted. 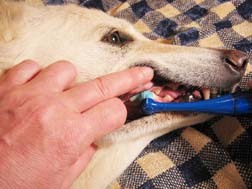 Cleaning your dogs teeth as shown in the picture is a fruitless exercise when gum disease in dogs has gone as far as it has in this dogs case. The simple act of diet change that includes raw bones – easily digested by dogs – will natuarlly clean up the gums and teeth within weeks and stop gum disease progressing further. I also recommend spraying your dogs mouth with Colloidal Silver as an excellent anti viral, anti bacterial and anti fungal teeth cleaner. It gets to work right away halting the spread of gum disease. Just open your dogs mouth and spray the teeth from both sides. There’s no telling how in pain your dog could be. You know what it’s like to have severe tooth ache – horrible! Imagine your dog going through this every day! At the end of the analysis it’s very clear, just feed your dog a healthy diet and her teeth will take care of themselves. Have a good look inside your dog’s mouth; see how clean the teeth are. Take a good deep breath right in front of your dog’s nose – does it smell sweet or foul? 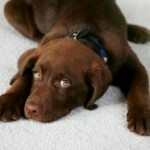 Your dog’s breath is the acid test to quickly determine the state of overall diet related health. If she failed the test, which means she smells a bit like being downwind of the factory that produced the commercial food you feed her, then at least you know precisely where you are, in the process of transitioning from commercial to natural food. There are not all that many ways to accurately tell how healthy your dog is at a glance, at least from a clinical perspective, but this odor test is the most obvious. When you notice foul breath, yellow teeth with tartar buildup along the gum line and red or inflamed gums, it’s time to take action to save your dog from a dismal future. If you discover these symptoms, act now, don’t leave this problem any longer. Have your dog’s teeth professionally cleaned, and then switch their diet to avoid the problem coming back. Watch the short video below as I talk more about stopping bad doggy breath and gum disease in dogs. Once your dog is on a meat and bone based diet as nature intended, her teeth will be scrubbed and polished simply by eating. Her breath will freshen up and her immune system will begin to function optimally, protecting her for a longer, healthier and more fully lived life. 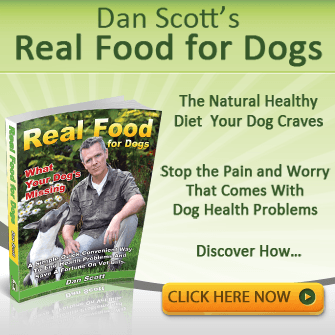 Even if your dog is old and has been eating commercial food for years, it’s never too late to make the rest of their lives pain and disease-free, extending those years as much as possible. 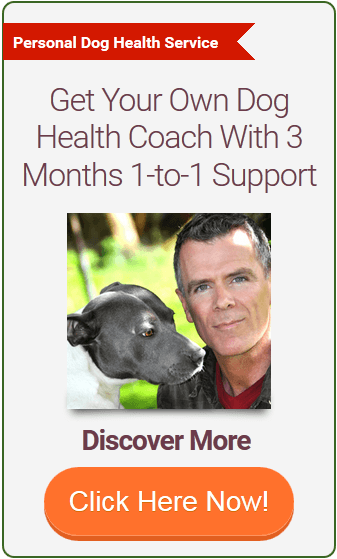 For more details of how you can help your dog to ultimate health quickly get my free report below.